The advantages of e-mail marketing are many - for starters, it's targeted, direct and measurable. But it's extremely important to know the minds of consumers when crafting an e-mail strategy. Miss the mark and you can easily earn a black eye for your company. New research from Epsilon, a direct marketing company, reveals some important insight into the mind of the e-mail subscriber. The study shows some important e-mail trends and attitudes, such as what type of message subscribers are accustomed to receiving and preferences, such as desired formats. But three revelations are of particular interest to marketers. The first deals with the reasons users unsubscribe to e-mail lists. The most popular is irrelevant content. That should come as no surprise to marketers. Companies should never send out unexpected e-mails; those messages not in line with the expectations of consumers when they signed up. Not only will unsubscribes result but so will SPAM complaints, hindering the business' future campaigns. The second most popular reason for unsubscribing is "receive too frequently." This highlights a delicate balance for marketers. You want to stay top-of-mind with the consumer but you don't want to overwhelm them. E-mail is a personal space for most people - even more so when you consider the influx of smartphones in the marketplace. With e-mail enabled devices, a message hitting the inbox is akin to a text message or a phone call - it triggers an immediate reaction for the user. You don't want to invade their personal space during family dinner time, for example. In fact, 64 percent of U.S. respondents attributed frequency to unsubscribing - double that of privacy concerns. One workaround for this problem is to ask your consumers directly, how often do you want to receive messages? The second important revelation in this study deals with the e-mail sender. Respondents indicated that the "from" line of an e-mail is vastly more important than the "subject" line (68 percent vs. 26 percent). And that's a bona fide trend. 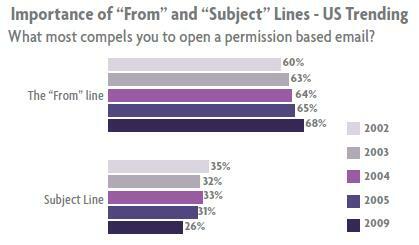 In 2002 the "from" line was important to 60 percent of respondents, while the "subject" line was important to 35 percent. What this means is that consumers are now much more concerned with who is sending them a message than the content of the message itself. That points to the critical importance of branding and trust-building with your audience, and again points to relevance. Once a user gets accustomed to receiving relevant messages from your brand, they are much more likely to open your next message. Before even considering the content they know it contains value to them. However, this is not to say the subject line is irrelevant. In fact, marketers can find great success when the subject line correlates to the sender. For example, a message from "jdoe@johndoeshoes.com" with a subject line of "20 percent off your next shoe purchase" reinforces not only that the sender is relevant to their needs but the message has a clear, valuable offer. It's also important that new e-mail subscribers see your brand associated with relevant subjects from the start. Finally, Epsilon asked what type of subject lines compel users to actually open the message. The most popular response was a discount offer (66 percent) followed by a free product offer (63 percent) and "contains familiar brand name" (60 percent). The rest of the report is available through Epsilon and is worth a look before your next e-mail campaign.